STAT1 mediates signaling in response to IFN-α, -β, and -γ, cytokines required for protective immunity against several viral, bacterial, and eukaryotic pathogens. The protective role of STAT1 in the control of intranasal infection with the obligate intracellular bacterium Chlamydia pneumoniae was analyzed. IFN-γ−/− or IFN-γ receptor (R)−/− mice were highly susceptible to infection with C. pneumoniae. We found that STAT1−/− mice were even more susceptible to C. pneumoniae than IFN-γ−/− or IFN-γR−/− mice. 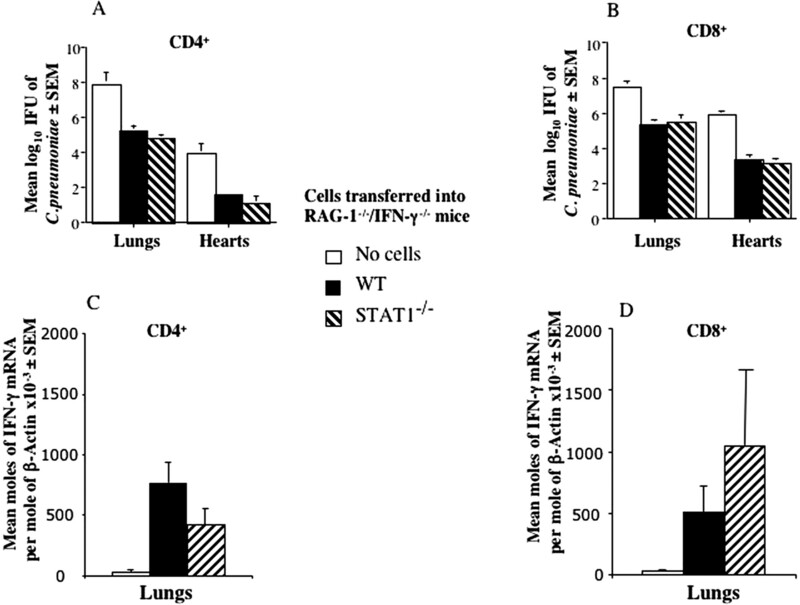 Phosphorylation of STAT1 was detected in the lungs of C. pneumoniae-infected wild-type, IFN-γR−/−, and IFN-αβR−/− mice, but not in mice lacking both IFN-αβR and IFN-γR. In line with this, IFN-αβR−/−/IFN-γR−/− mice showed increased susceptibility to infection compared with IFN-γR−/− mice. However, C. pneumoniae-infected IFN-αβR−/− or IFN regulatory factor 3−/− mice showed no increased susceptibility and similar IFN-γ expression compared with wild-type mice. CD4+ or CD8+ cells released IFN-γ in vivo and conferred protection against C. pneumoniae in a STAT1-independent manner. In contrast, STAT1 mediated a nonredundant protective role of nonhemopoietic cells but not of hemopoietic cells. Nonhemopoietic cells accounted for the expression of STAT1-mediated indoleamine 2, 3-dioxygenase and the p47 GTPase LRG-47, but not inducible NO synthase mRNA. In summary, we demonstrate that STAT1 mediates a cooperative effect of IFN-αβ and IFN-γ on nonhemopoietic cells, resulting in protection against C. pneumoniae. Binding of cytokines to their respective receptors results in the phosphorylation of STATs by different receptor-associated Janus kinases (1). IFN-αβ and IFN-γ share STAT1 as a signaling component. Phosphorylation of STAT1 is a requirement for its activation, which results in the formation of homodimeric (STAT1 · STAT1), heterodimeric, (STAT1 · STAT2) or heterotrimeric (STAT1 · STAT2 · IFN regulatory factor-9) protein complexes. These multimeric transcription factors translocate to the nucleus, where they activate IFN-inducible genes that participate in host defense (2). The loss of STAT1 function in humans or mice results in a dramatically increased susceptibility to viral (3, 4), bacterial (3), and protozoal infections (5, 6). This phenotype has been attributed to the nonredundant role of STAT1 in IFN-αβR and IFN-γR signaling. However, STAT1-independent functions for IFNs, including antiviral responses, cell proliferation, and gene expression have also been shown (7, 8). During viral infections, IFN-αβ-dependent mechanisms will interfere with virus replication by inducing cells to an antiviral state (1). IFN-γ, in contrast, mediates resistance primarily against intracellular bacteria and protozoa (9), probably through its ability to activate macrophages. Both IFN-αβ and IFN-γ have also been shown to contribute to the control of T cell proliferation and differentiation, although the role of STAT1 in regulation of adaptive immune responses is controversial (10, 11, 12, 13). The obligate intracellular Gram-negative bacterium Chlamydia pneumoniae is a common agent of acute respiratory disease (14). IFN-γ is central in resistance against chlamydia, as demonstrated by the reduced bacterial growth in different IFN-γ-stimulated cells and by the enhanced susceptibility of mice treated with neutralizing anti-IFN-γ Abs or genetically deficient in IFN-γ or IFN-γR (15). A protective role for IFN-αβ against infection with chlamydia has been indicated by the inhibition of Chlamydia trachomatis growth in epithelial cells or fibroblasts treated with recombinant IFN-α or natural IFN-αβ (16, 17, 18, 19). We have previously shown that C. pneumoniae infection-induced IFN-αβ is important for bacterial control in bone marrow-derived macrophages (BMM).4 IFN-αβ will induce the expression of IFN-γ, which in turn mediates control of infection (20). Furthermore, infection-induced IFN-γ expression in BMM is STAT1-dependent (21). However, the role of IFN-αβ and STAT1 in the control of C. pneumoniae infection in vivo, and the role of both STAT1 and IFN-αβ in regulation of IFN-γ expression in infected lungs is unknown. In this study, the role of STAT1 in resistance against C. pneumoniae infection was investigated. We suggest that IFN-αβ and IFN-γ cooperate in protection against C. pneumoniae through their ability to activate STAT1. STAT1 was not required for CD4+ or CD8+-mediated protection against infection. Instead, we demonstrate that nonhemopoietic cells are the main effectors of STAT1-mediated control of infection. Mutant mouse strains without IFN-αβR (22), IFN-γR (23), IFN regulatory factor (IRF)3 (24), IFN-γ (25), and STAT1 (4) were generated by homologous recombination in embryonic stem cells. IFN-αβR−/−/IFN-γR−/− were purchased from B&K Universal. Animals were bred and kept under specific pathogen-free conditions. C57BL/6 mice were used as wild-type (WT) controls for STAT1−/−, IFN-γ−/−, and IRF3−/− mice. 129Sv/Ev mice were used as WT controls for IFN-αβR−/− and IFN-αβR−/−/IFN-γR−/− mice. IFN-γR−/− were backcrossed eight times to the C57BL/6 background. Depending on the experiment, IFN-γR−/− mice on either the C57BL/6 or 129Sv/Ev background were used. Animals were 6–10 wk old at the start of experiments. The Stockholm Region Animal Welfare Review Board approved all animal studies. Mycoplasma-free C. pneumoniae isolate Kajaani 6 (26) was propagated in HL cells. Infected cells were sonicated, cell remnants were removed by centrifugation (6 min at 100 × g), and the bacteria were stored in small aliquots in sucrose-phosphate-glutamate (SPG) buffer at −70°C until further use. The infectivity as measured by inclusion forming units (IFU) of bacterial preparation was determined in HL cells as described below. Mice were inoculated intranasally (i.n.) with 106 IFU of C. pneumoniae diluted in 40 μl of PBS. Animals were sacrificed at different time points after infection, and right lungs and, in some experiments, hearts were removed and stored in 2 ml of SPG buffer. The organs were then mechanically disrupted on a metal-grid mesh, homogenates were centrifuged (6 min at 500 × g) to remove course tissue debris, and lysates were stored at −20°C until further use. Infectious titers from C. pneumoniae-infected lungs and hearts were quantified in HL cells. Five to 100 μl of aliquots of SPG lysates were used in duplicate to infect overnight cultures of confluent HL cells grown on round 13-mm2 glass cover slides in 24-well plates. HL cells were plated at a density of 3.5 × 105/ml in DMEM containing glucose and supplemented with 2 mM glutamine, 5% FCS, and 25 μg/ml streptomycin (DMEM-Strep) (all reagents were obtained from Sigma-Aldrich). Inoculated cells were centrifuged for 1 h at 500 × g, 35°C. Thereafter, supernatant was removed, and DMEM-Strep containing 0.5 μg/ml cycloheximide was added. Cells were incubated at 35°C for 72 h, 5% CO2, thereafter washed gently with PBS, and fixed with methanol. Glass cover slides were then stained for 30 min at room temperature with a FITC-conjugated Chlamydia genus-specific mAb (1/5 dilution; Pathfinder Chlamydia Confirmation System; Bio-Rad). IFU of C. pneumoniae were quantified by fluorescence microscopy. The infectivity was expressed as IFU per tissue ± SEM. Mouse BMM were differentiated using L929 cell-conditioned medium as described (20). We have previously shown by immunofluorescence staining that these cells are F4/80+, CD14+, and Mac-3 + (20). For C. pneumoniae infection of BMM, a multiplicity of infection of 1 was used. Bacteria were added directly to BMM cultures that were then centrifuged at 500 × g for 1 h, 35°C. Mouse BMDC were differentiated as described previously (27). Briefly, bone marrow was extracted from tibia and femurs, and cell suspensions were cultured in IMDM (Cambrex) containing 10% FCS, 100 U/ml penicillin, 100 μg/ml streptomycin, and 10 ng/ml GM-CSF (PeproTech). Fresh medium and cytokine were given every 2–3 days. On days 3 to 7, loosely adherent cells were harvested and infected with C. pneumoniae as described for BMM. Lungs from C. pneumoniae-infected mice were obtained. The pulmonary vasculature was perfused, and lungs were aseptically removed and subjected to collagenase treatment for 1 h at 37°C in RPMI 1640 containing 2 mM glutamine, 5% FCS, and 25 μg/ml streptomycin. Digested lung pieces were then mechanically homogenized and filtered through a 100-μm cell-strainer. Cells were washed twice and counted by trypan-blue exclusion. Where indicated, mononuclear cells (MNC) were isolated from such lung single-cell suspensions using a one-step gradient separation method with Nycoprep (Nycomed Pharma) according to the manufacturer’s instructions. Single-cell suspensions from control and C. pneumoniae-infected mice were lysed and separated on 10% separating/5% stacking SDS-polyacrylamide gels as described above (15). Samples were then transferred onto nitrocellulose membranes (Bio-Rad) by electroblotting at 100 V, 250 mA for 1 h. Immunostaining was performed using polyclonal rabbit anti-phosphorylated (Tyr701) STAT1, anti-total STAT1 (1/1000 dilution; both obtained from Cell Signaling), or anti-actin (1/500 dilution; Sigma-Aldrich). Membranes were then washed and incubated with HRP-conjugated polyclonal goat anti-rabbit Igs (1/2000 dilution; DakoCytomation) and developed using ECL-Plus (Amersham Pharmacia Biotech) and photographed using a Fuji intelligent darkbox II digital camera. CD4+ cell and CD8+ cell suspensions were prepared from spleens as described previously (28). Briefly, spleen cell suspensions were obtained from uninfected WT or STAT1−/− mice and filtered through a nylon-wool column, incubated with either FITC-labeled rat anti-mouse CD4 (clone L3T4) or PE-labeled rat anti-mouse CD8α (clone 53–6.7), and CD4+ or CD8+ cells were sorted by using a FACSVantage sorter (BD Biosciences). To control the phenotype of the positive selected cells, 5 × 105 cells were stained with either fluorochrome-labeled anti-CD3, anti-αβ TCR, anti-CD19, anti-CD8, or anti-CD4, before FACS analysis using a FACS-scan apparatus (data not shown). B cells or other subpopulations of T cells were not detected. All Abs used were obtained from BD Pharmingen. RAG-1−/−/IFN-γ−/− mice were inoculated in the tail vein with 5 × 106 CD4+ or CD8+ spleen cells. Two weeks after cell inoculation, mice were infected with C. pneumoniae as described above. The efficiency and specificity of lymphoid reconstitution has been previously confirmed by staining with anti-CD4, anti-CD8, anti-αβ TCR, anti-CD19, or anti-CD3, followed by flow cytometric analysis (22). Bone marrow cells from uninfected STAT1−/− and WT mice were harvested by flushing with cold PBS through the bone marrow cavities, and RBC were lysed. To create bone marrow chimeras, WT and STAT1−/− mice were irradiated with 900 cGy and 4 h later inoculated in the tail vein with 2 × 107 bone marrow cells from WT or STAT1−/− mice. Six weeks after reconstitution, mice were infected with C. pneumoniae. Mice were sacrificed 21 days after infection. Spleen cells from chimeric and control mice were obtained, and the presence of total STAT1 was determined by Western blotting as described above. Fragments from the left lung of uninfected or C. pneumoniae-infected mice, BMM or BMDC were homogenized in RNAzol B solution (Nordic Biosite), and total RNA was isolated according to the manufacturer’s instructions. Three to 4 μg of total RNA were then reversed transcribed into cDNA as described previously (29). Specific primer pairs for IFN-α, IFN-γ, IL-12p40, IL-12Rβ1, inducible NO synthase (iNOS) and β-actin were used to amplify cDNA. Except for IL-12Rβ1, target molecules were quantified by competitive PCR as described previously (29). Briefly, competitor fragments with a different length but using the same primers as the target cDNA were constructed using composite primers and an exogenous DNA fragment (30). Three- to 4-fold serial dilutions of the competitor were amplified in the presence of a constant amount of cDNA. Reactions were conducted for 23–41 cycles in a thermal cycler (PerkinElmer) using an annealing step of 60°C. Amplified cDNAs were visualized in ethidium bromide-stained 2% agarose gels. All sequences used, except IL-12Rβ1, have been previously reported in Ref. 14 . Primers used for IL-12Rβ1 were as follows: sense IL-12Rβ1, 5′ GAA CCA CAC ACA CTG TAC CCT G 3′ and antisense IL-12Rβ1, 5′ TTA GTG GGT GGC ACG AGC C 3′. IDO, iNOS, LRG-47, and hypoxanthine guanine phosphoribosyltransferase (HPRT) transcripts in lungs from STAT1−/− and WT radiation bone marrow chimeric mice infected with C. pneumoniae were quantified by real-time PCR. Total RNA from lungs were isolated and reversed transcribed into cDNA as described above. The real-time PCR was performed in duplicate reactions containing Platinum SYBR Green qPCR Supermix-UDG (Applied Biosystems), forward and reverse primers, and 0.5 μl of cDNA on an ABI Prism 7500 sequence detection system (Applied Biosystems). The following primer sequences were used at between 50 and 250 nM: sense IFN-γ, 5′ GCT TTG CAG CTC TTC CTC AT 3′ and antisense IFN-γ, 5′ CAC ATC TAT GCC ACT TGA GTT AAA ATA GT 3′; sense IDO, 5′ GAG AAA GCC AAG GAA ATT TTT AAG AG 3′ and antisense IDO, 5′ TAT GCG GAG AAC GTG GAA AAA C 3′; sense LRG-47, 5′ CTG GCA ATG GCA TGT CAT CT 3′ and antisense LRG-47, 5′ AGC CGA GGC ATC TTC ATC AT 3′; sense iNOS, 5′ CAG CTG GGC TGT ACA AAC CTT 3′ and antisense iNOS, 5′ CAT TGG AAG TGA AGC GTT TCG 3′; sense HPRT, 5′ CCC AGC GTC GTG ATT AGC 3′ and antisense HPRT, 5′ GGA ATA AAC ACT TTT TCC AAA TCC 3′. Serial-fold dilutions of a cDNA sample were amplified to control amplification efficiency for each primer pair. The threshold cycle (Ct) values for all cDNA samples were obtained. HPRT was used as a control gene to calculate the ΔCt values for individual samples. The relative amount of cytokine/HPRT transcripts was calculated using the 2−(ΔΔCt) method as described (31). These values were then used to calculate the relative expression of target mRNA in the lungs. In a first set of experiments, the resistance of IFN-γ−/− mice following intranasal infection with C. pneumoniae was analyzed. Compared with WT controls, IFN-γ−/− mice showed increased titers of C. pneumoniae in lungs at different time points after infection (Fig. 1⇓A), confirming our previous observations with IFN-γR−/− mice (32, 33). The role of STAT1 in the outcome of C. pneumoniae infection was next addressed. We found that STAT1−/− mice displayed higher bacterial load (Fig. 1⇓B) and mortality (Fig. 1⇓C) in comparison to IFN-γ−/− and IFN-γR−/− mice. Role of STAT1 in the outcome of infection with C. pneumoniae. A, IFN-γ−/− and WT mice (8–18 mice per time point and group) were inoculated i.n. with 106 IFU of C. pneumoniae. At the indicated time points after infection, animals were sacrificed, and lung levels of C. pneumoniae were assessed. The mean log10 IFU per lung is depicted. Bars indicate SEM. Differences between C57BL/6 and IFN-γ−/− mice are significant at all time points (p < 0.05, Student’s t test). B, IFN-γ−/−, IFN-γR−/−, and STAT1−/− mice (all on the C57BL/6 background) were inoculated i.n. with 106 IFU of C. pneumoniae. At the indicated time points after infection, animals were sacrificed, and lung levels of C. pneumoniae were assessed. The mean log10 IFU per lung is depicted. Bars indicate SEM. Seven to 11 mice per time point and group were used. Differences between STAT1−/− mice and IFN-γ−/− or IFN-γR −/− mice are significant (p < 0.001, Student’s t test). C, IFN-γR−/− and STAT1−/− mice were inoculated i.n. with 106 IFU of C. pneumoniae, and survival was monitored for 60 days. Eight and 10 mice per group were used. Differences between IFN-γR−/− and STAT1−/− mice are significant (χ2 < 0.01, Kaplan-Meier method). D and E, WT (D and E), IFN-αβR−/−/IFN-γR−/− (E), IFN-αβR−/− (D), and IFN-γR−/− (D) mice were inoculated i.n. with 106 IFU of C. pneumoniae and sacrificed 15 days after infection. Protein extracts were prepared from single-cell suspensions from the lungs or spleens of individual mice. Lung MNC were obtained using a single-step gradient separation method with Nycoprep (Nycomed Pharma). Samples were separated by SDS-PAGE, electroblotted onto nitrocellulose membranes, and immunoblotted with Abs that specifically recognize actin, total-STAT1, and pSTAT1. Abs were detected with HRP-conjugated anti-IgG followed by ECL detection. Because STAT1 can be phosphorylated upon binding of IFN-γ or IFN-αβ to their respective receptors, the levels of phosphorylated STAT1 (pSTAT1) in lungs from mice infected with C. pneumoniae were determined. Lysates from total lung from infected WT, IFN-γR−/−, and IFN-αβR−/− mice showed presence of pSTAT1 (Fig. 1⇑D). However, pSTAT1 was not detected in either lung or lung MNC lysates from C. pneumoniae-infected IFN-αβR−/−/IFN-γR−/− mice (Fig. 1⇑E). pSTAT1 was not detected in spleen lysates from WT or IFN-αβR−/−/IFN-γR−/− infected mice. Interestingly, the levels of total STAT1 protein seemed diminished in spleen and lung MNC from IFN-αβR−/−/IFN-γR−/− mice as compared with WT controls (Fig. 1⇑E). In conclusion, our observations demonstrate a major role for STAT1 in resistance against C. pneumoniae infection, and both IFN-αβ and IFN-γ seem to participate in activation of STAT1. The role of IFN-αβ in the outcome of infection with C. pneumoniae was then studied. Enhanced IFN-α mRNA accumulation was not observed in lungs from C. pneumoniae-infected WT mice (Fig. 2⇓A). Levels of IFN-αβ in the sera of C. pneumoniae-infected mice were below the detection limit (15 IU/ml) of the bioassay used. IFN-αβR−/− mice did not display enhanced susceptibility to C. pneumoniae (Fig. 2⇓B). In line with this, WT and mice deficient in IRF3, a transcription factor that controls expression of IFN-β and thereby also IFN-α (34), showed similar pulmonary bacterial load (Fig. 2⇓C). 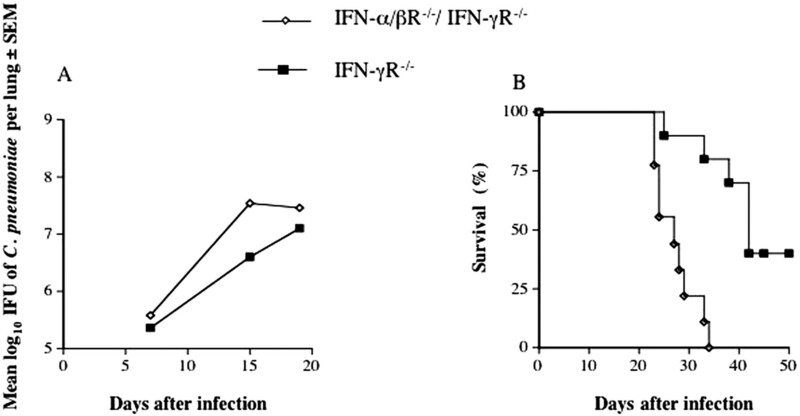 Outcome of infection with C. pneumoniae in IFN-αβR−/− and IRF3−/− mice. A, C57BL/6 mice were inoculated i.n. with 106 IFU of C. pneumoniae. At the indicated time points after infection, total RNA was obtained from individual lungs and reverse transcribed into cDNA, and the levels of IFN-α or β-actin in 4–5 mice per group were measured by competitive RT-PCR. The mean moles of IFN-α per mole of β-actin mRNA are depicted. Differences between uninfected and infected are not significant. B and C, IFN-αβR−/− (B), IRF3−/− (C), and WT (B and C) mice (8–18 mice per time point and group) were inoculated i.n. with 106 IFU of C. pneumoniae. 129Sv/Ev mice were used as controls for IFN-αβR−/− mice, whereas C57BL/6 mice were used as controls for IRF3−/− mice. At the indicated time points after infection, animals were sacrificed, and lung levels of C. pneumoniae were assessed. The mean log10 IFU per lung ± SEM is depicted. Differences between WT and IFN-αβR−/− mice at 14 days (but not at 7 or 24 days) are significant (p < 0.01, Student’s t test). Differences between WT and IRF3−/− mice are not significant. D–G, WT and IFN-αβR−/− mice were inoculated i.n. with 106 IFU of C. pneumoniae, and the accumulation of IFN-γ, IL-12p40, iNOS, and IL-12Rβ1 mRNA in lungs from C. pneumoniae-infected WT and IFN-αβR−/− mice was then measured. Mice were sacrificed 14 days after infection, and total RNA was obtained from lungs and reverse transcribed into cDNA. IFN-γ (D), IL-12p40 (E), and iNOS (F) were quantified by competitive RT-PCR. The mean moles of IFN-γ, IL-12p40, or iNOS per mole of β-actin mRNA in five mice per group are depicted. Bars indicate SEM. The accumulati on of IL-12Rβ1 and β-actin mRNA (G) in individual mice was visualized by RT-PCR. Next, we addressed whether an increased expression of IFN-γ or IFN-γ-inducible molecules could account for the similar level of C. pneumoniae in lungs of IFN-αβR−/− and WT mice. Lungs from C. pneumoniae-infected WT and IFN-αβR−/− mice showed similar levels of IFN-γ, iNOS, IL-12p40, and IL-12Rβ1 mRNA (Fig. 2⇑, D–G). In light of these findings, IFN-αβ seem dispensable for protection against C. pneumoniae. This was surprising because both IFN-αβ and IFN-γ participate in STAT1 activation, and STAT1−/− mice are more susceptible to C. pneumoniae compared with IFN-γ−/− or IFN-γR−/− mice. Thus, we hypothesized that mice lacking both IFN-γR and IFN-αβR should display higher susceptibility to C. pneumoniae compared with either IFN-γR−/− or IFN-αβR−/−. In fact, IFN-αβR−/−/IFN-γR−/− mice displayed higher pulmonary bacterial load (Fig. 3⇓A) and cumulative mortality (Fig. 3⇓B) than IFN-γR−/− mice. We therefore suggest that IFN-αβ are involved in protection against C. pneumoniae by cooperating with IFN-γ for activation of STAT1. Interestingly, whereas lungs from IFN-γR−/− or STAT1−/− mice sacrificed 60 days after infection contained elevated numbers of C. pneumoniae, no bacteria were detected in lungs from WT mice sacrificed in parallel (data not shown). Enhanced mortality and growth of C. pneumoniae in the lungs of IFN-αβR−/−/IFN-γR−/− mice compared with IFN-γR−/− mice. A, IFN-γR−/− and IFN-αβR−/−/IFN-γR−/− mice were inoculated i.n. with 106 IFU of C. pneumoniae. At the indicated time points after infection, animals were sacrificed, and lung levels of C. pneumoniae were assessed. The mean log10 IFU per lung is depicted. Nine to 10 mice per time point and group were used. Differences between IFN-αβR−/−/IFN-γR−/− and IFN-γR −/− mice at 15 and 20 days after infection are significant (p < 0.001, Student’s t test). B, IFN-γR−/− and IFN-αβR−/−/IFN-γR−/− mice were inoculated i.n. with 106 IFU of C. pneumoniae, and survival was monitored for 61 days. Ten to 11 mice per group were used. Differences between IFN-γR−/− and IFN-αβR−/−/IFN-γR−/− mice are significant (χ2 < 0.001, Kaplan-Meier method). We found that IFN-αβ are not required for IFN-γ expression during infection in vivo (Fig. 2⇑B). On the contrary, the expression of IFN-γ in C. pneumoniae-infected BMM was found to be IFN-αβ-dependent (Fig. 4⇓A), confirming previous reports (20). To understand this discrepancy, the regulation of IFN-γ expression in C. pneumoniae-infected BMDC and BMM was compared. Both, IFN-αβR−/− and WT BMDC showed increased IFN-γ mRNA accumulation after infection (Fig. 4⇓B). Thus, the ability of IFN-αβ to regulate myeloid IFN-γ expression depends on the particular cell population. Different regulation of IFN-γ expression in C. pneumoniae-infected BMM and BMDC. A and B, Total RNA was extracted from WT and IFN-αβR−/− BMM (A) and BMDC (B) at the indicated time points after infection with C. pneumoniae. The accumulation of IFN-γ and β-actin mRNA were visualized by RT-PCR. A representative from two independent experiments is shown. Because STAT1 has been suggested to control the development of T cell responses (2), the requirement of STAT1 in T cell-mediated protection against C. pneumoniae was tested. For this purpose, RAG-1−/−/IFN-γ −/− mice were inoculated i.v. with CD4+ or CD8+ cells and infected with C. pneumoniae 24 days after cell transfer. CD4+ or CD8+ cells are here the only source of IFN-γ, the secretion of which is necessary and sufficient for protection (28). Inoculation of either CD4+ or CD8+ WT spleen cells into RAG-1−/−/IFN-γ−/− mice had a dramatic effect on protection; C. pneumoniae levels in lungs 21 days after infection were 100- to 1000-fold lower in reconstituted animals compared with unreconstituted controls (Fig. 5⇓, A and B). STAT1−/− CD4+ or STAT1−/− CD8+ cells were also able to confer protection (Fig. 5⇓, A and B) and, notwithstanding a high dispersion of the data, expressed similar levels of IFN-γ mRNA as RAG-1−/−/IFN-γ−/− mice inoculated with WT CD4+ or CD8+ cells (Fig. 5⇓, C and D). Role of STAT1 in CD4+ or CD8+ cell-mediated resistance against C. pneumoniae. A total of 5 × 106 WT or STAT1−/− CD4+ (A) or CD8+ (B) spleen cells were inoculated i.v. into RAG-1−/−/IFN-γ−/− mice (10–12 individual mice per group). A control group was left untreated. Twenty-four days after inoculation, mice were infected i.n. with 106 C. pneumoniae. Mice were sacrificed 24 days after infection, and the number of IFU in individual lungs and hearts was determined. The mean log10 IFU per lung or heart is shown. C–D, Total RNA was obtained from individual lungs from RAG-1−/−/IFN-γ−/− T cell-reconstituted mice after 24 days of infection and then transcribed into cDNA, and IFN-γ or HPRT was measured by real-time PCR. The moles of IFN-γ per mole of HPRT mRNA from four individuals per group are depicted. Differences between RAG-1−/−/IFN-γ−/− mice inoculated with CD4+ WT and CD4+ STAT1−/−, or CD8+ WT and CD8+ STAT1−/− spleen cells were not significant. IFN-γ content in four individual samples was standardized by comparison with competitive PCR determinations. Differences of reconstituted vs nonreconstituted group are significant (p < 0.001, Student t test). Phagocytes and nonprofessional phagocytes have been shown to inhibit chlamydial growth when activated by IFN-γ (35, 36, 37). Whether the protective effect of STAT1 was exerted by hemopoietic and/or nonhemopoietic cells was then examined. For this reason, reciprocal bone marrow radiation chimeras between WT and STAT1−/− mice, in which either hemopoietic or somatic cells lacked the ability to express STAT1, were generated. Total STAT1 was detected by Western blotting in spleens from WT (donor)→ STAT1−/− (recipient) and STAT1−/− → WT mice 9 wk after bone marrow cell transfer, confirming that repopulation by the inoculated stem cells took place (Fig. 6⇓A). Hemopoietic cells were not required for STAT1-mediated control of C. pneumoniae, because STAT1−/−→ WT chimeras and WT→ WT controls showed similar susceptibility to infection (Fig. 6⇓B). Not even a minor role for STAT1-mediated hemopoietic cell control of C. pneumoniae infection could be shown, because similar bacterial numbers were found in lungs from WT→ STAT1−/− and STAT1−/−→ STAT1−/− mice. 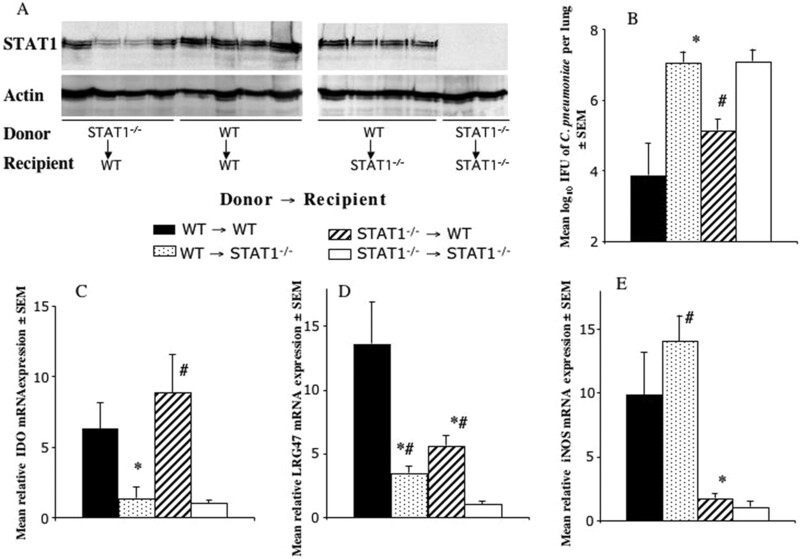 STAT1−/−→ WT and WT→ WT mice showed lower bacterial load in lungs compared with WT → STAT1−/− and STAT1−/−→STAT1−/− reconstituted animals (Fig. 6⇓B), demonstrating the relevance of nonhemopoietic cells in STAT1-mediated control of C. pneumoniae infection. STAT1-mediated resistance against infection with C. pneumoniae is primarily explained by the activity of nonhemopoietic cells. A, A total of 2 × 107 STAT1−/− or WT bone marrow cells was inoculated i.v. into irradiated STAT1−/− or WT mice. Six weeks after cell inoculation, mice were infected i.n. with 106 C. pneumoniae. Mice were sacrificed 21 days after infection. Protein extracts were prepared from single-cell suspensions from the spleens of individual mice. Samples were separated by SDS-PAGE, electroblotted onto nitrocellulose membranes, and immunoblotted with Abs that specifically recognize total STAT1 and actin. Abs were detected with HRP-conjugated anti-IgG followed by ECL detection. B, The number of IFU was determined in individual lungs from mice treated as in A. The mean log10 IFU per lung of nine mice per group is shown. C–E, The levels of IDO (C), LRG-47 (D), and iNOS (E) mRNA in individual lungs from mice treated as in A was determined by real-time PCR. The mean fold increase of IDO, LRG-47, and iNOS in relation to HPRT of four animals per group ± SEM are depicted. ∗, Differences of chimeric mice vs WT→WT sham chimera are significant (p < 0.05, Student t test). #, Differences of chimeric mice vs STAT1−/−→STAT1−/− sham chimera are significant (p < 0.05, Student t test). In all panels, differences between STAT1−/−→ STAT1−/− and WT→WT mice are significant (p < 0.001 Student t test). Because IDO, LRG-47, a member of the p47 GTPase family, and iNOS are all STAT1-regulated antimicrobial effector enzymes (38), their expression were measured in lungs obtained from C. pneumoniae-infected STAT1 and WT radiation chimeras. IDO, LRG-47, and iNOS were all found to be induced in WT mice infected with C. pneumoniae. Mock-reconstituted WT mice (WT → WT) expressed higher levels of IDO, LRG-47, and iNOS mRNA compared with STAT1−/−→ STAT1−/− controls (Fig. 6⇑, C–E). Lung nonhemopoietic cells exclusively accounted for STAT1-induced IDO expression, because 1) similar levels of IDO mRNA were detected in WT→WT and STAT1−/−→WT chimeras and 2) STAT1−/−→STAT1−/− and WT→STAT1−/− bone marrow chimeras showed similar levels of IDO mRNA (Fig. 6⇑C). Both STAT1−/−→ WT and WT→ STAT1−/− chimeras showed diminished levels of LRG-47 mRNA compared with WT→ WT reconstituted animals but higher levels compared with STAT1−/−→ STAT1−/− mock chimeras, suggesting that LRG-47 mRNA expression depends on both nonhemopoietic and hemopoietic cells (Fig. 6⇑D). Finally, iNOS mRNA accumulation occurred mainly in hemopoietic cells, because lungs from WT→ WT and WT→ STAT1−/− chimeras showed similar levels of iNOS mRNA, whereas lungs of STAT1−/−→ WT chimeras showed diminished iNOS mRNA levels (Fig. 6⇑E). Our observations suggest that STAT1 activation mediated through both IFN-αβR and IFN-γR signaling is important for host resistance against C. pneumoniae. A complete lack of STAT1 phosphorylation was observed in infected lungs from IFN-αβR−/−/IFN-γR−/− but not IFN-γR−/− or IFN-αβR−/− mice. In line, STAT1−/− mice showed higher susceptibility to infection than IFN-γ−/− or IFN-γR−/− mice. Positive cross-talk between IFN-αβR and IFN-γR signaling at the level of STAT1 is well documented, where pretreatment of cells with IFN-αβ augments the subsequent response to IFN-γ, and vice versa (2). Interestingly, cooperation between IFN-αβ and IFN-γ seems not only to control STAT1 phosphorylation but also STAT1 expression. An increased expression of STAT1 has been previously reported in cells infected with C. trachomatis or Mycobacterium tuberculosis (39, 40, 41). The administration of IFN-αβ or IFN-αβ inducers has been shown to protect or ameliorate disease in mice infected with intracellular bacteria (42, 43, 44), intracellular protozoa (45, 46, 47), or fungi (48). Although secretion of IFN-αβ has been reported in vivo in mice infected with several nonviral pathogens (41, 42, 43, 44, 45), a protective role for secreted IFN-αβ during nonviral infections in vivo is poorly documented and controversial. Leishmania major infection-induced IFN-αβ have been shown to stimulate iNOS-dependent parasite containment in vivo (49). Also, M. tuberculosis-infected IFN-αβR−/− mice displayed a slightly reduced ability to limit early bacterial growth (50). These reports, together with our current findings, constitute to our knowledge the only data providing a protective role for endogenous IFN-αβ during nonviral, experimental infections. In contrast, IFN-αβR−/− mice are more resistant to infection with Listeria monocytogenes (51, 52), and treatment with IFN-αβ increased the susceptibility to infection with a highly virulent strain of M. tuberculosis (53). We found that IFN-αβ are dispensable for in vivo control of C. pneumoniae because lungs from IFN-αβR−/−, IRF3−/−, and WT mice show similar bacterial levels after infection. Compensatory immune mechanisms could potentially explain the nonincreased susceptibility of IFN-αβR−/− mice to C. pneumoniae compared with WT controls. However, such compensation did not involve an increase in levels of IFN-γ, IL-12p40, IL-12Rβ1, or iNOS expression in C. pneumoniae-infected IFN-αβR−/− mice as compared with WT controls. 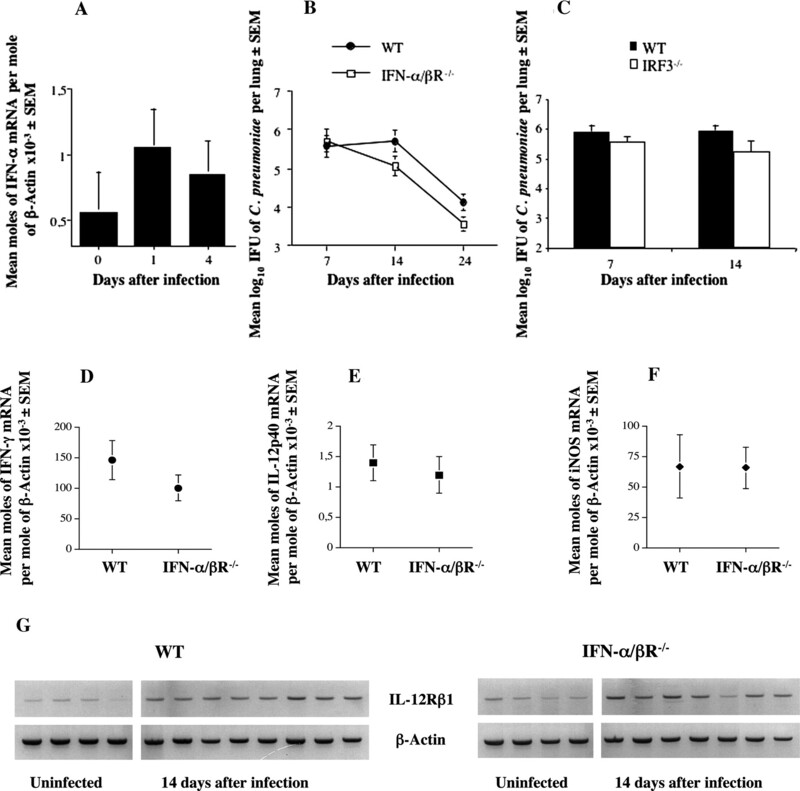 Studies show that during murine cytomegalovirus and lymphocytic choriomeningitis virus infection, endogenous IFN-αβ inhibit IL-12 and IFN-γ production (54). The low levels of IFN-αβ in C. pneumoniae-infected mice are probably not sufficient for inhibition of IL-12, which therefore governs IFN-γ production in vivo (33). Such low levels of IFN-αβ nevertheless contribute in activation of STAT1 and are thus involved in protection. Steady-state levels of IFN-αβ and IFN-γ have been shown to be important for STAT1 activation, even in the absence of infection (55). The IFN-αβR facilitates efficient assembly of IFN-γ-activated transcription factors. This cross-talk is dependent on a constitutive subthreshold IFN-αβ signaling (56). C. pneumoniae infection-induced expression of IFN-γ in lungs is independent of IFN-αβ. This is at variance with the C. pneumoniae-induced, IFN-αβ- and STAT1-dependent and IL-12-independent IFN-γ expression by BMM (20). We suggest that this discrepancy can be explained by a distinct regulation of IFN-γ in diverse cellular populations, because C. pneumoniae infection of BMDC lead to IFN-αβ-independent IFN-γ expression. Mice lacking STAT1 show no apparent abnormalities in T lymphocyte development besides the absence of functional CD4+CD25+ regulatory T cells (57). STAT1 has been shown to be required for T cell differentiation, mediating expression of the transcription factor T-bet (11, 58). In contrast, STAT1 might also convey antiproliferative and proapoptotic effects on T cells (59). We show in this study that both CD4+ STAT1−/− and CD8+ STAT1−/− cells have unimpaired ability to secrete IFN-γ and to confer protection against C. pneumoniae infection. Thus, STAT1 plays a major role in resistance to chlamydial infection, but is not necessary for CD4+ or CD8+ T cell activation. In line with our results, STAT1 has been shown to play a critical role in the regulation of antimicrobial effector mechanisms, but not in the development of Th1-type responses during toxoplasmosis (38). Several groups reported that, in addition to STAT1 and STAT2, STAT3, STAT4, and STAT5 are also components of the IFN-signaling machinery (59). At this time, the signaling pathways leading to IFN-γ secretion by T cells during C. pneumoniae infection remain to be studied in detail. Chlamydia can infect cells from hemopoietic and nonhemopoietic origin. Animal studies suggest that bronchial epithelial cells, alveolar epithelial cells, and endothelial cells are preferred target cells for acute chlamydial infection (60), wherefrom chlamydia can spread systemically to the vascular tissue. Chlamydial infection of both epithelial cells (58) and macrophages (15) results in STAT1 activation, and in vitro growth of C. pneumoniae in both BMM and lung fibroblasts is enhanced in the absence of STAT1 (15). Our data show that nonhemopoietic cells are the main effectors of STAT1-mediated control of infection in vivo. We found that C. pneumoniae infection induces iNOS, IDO, and LRG-47, a member of the p47 GTPase family, in a STAT1-dependent manner. IFN-γ has been shown to inhibit chlamydial strains in vitro in an IDO-mediated form (36, 61). Although IDO−/− and WT mice have recently been shown to have similar susceptibility to infections with human or murine strains of C. trachomatis (62), a role for IDO in protection against C. pneumoniae remains to be investigated. LRG-47 is required for host resistance to Toxoplasma gondii, L. monocytogenes, and M. tuberculosis infection (63, 64), and is induced in fibroblasts infected with C. trachomatis (62). Whereas IDO mRNA was induced exclusively by nonhemopoietic cells, STAT1 induction of LRG-47 involved both hemopoietic and nonhemopoietic cells. A role for p47 GTPases in IFN-γ-mediated resistance of C. trachomatis in oviduct epithelial cells has recently been described (60). The latter report and our observations together suggest a relevant role for p47 GTPases in nonhemopoietic control of Chlamydia species. On the contrary, iNOS was mainly induced in hemopoietic cells, suggesting that it plays a minor role in STAT1-mediated protection against C. pneumoniae. In line with this, iNOS has been shown to play a minor role in protection against chlamydial infections as compared with that exerted by IFN-γ (32, 65). In summary, we demonstrate a major role for STAT1 in resistance against C. pneumoniae. We suggest that signals from both IFN-γR and IFN-αβR cooperate in activation of STAT1. STAT1 is dispensable for T cell protective functions. In contrast, STAT1 induces microbicidal mechanisms in nonhemopoietic cells, leading to control of infection. We thank Berit Olsson for excellent technical assistance. STAT1−/− mice were provided by Dr. David Levy (New York University, NY, NY). IFN-γR−/− mice on the 129Sv/Ev background were provided by Dr. Michel Aguet (Swiss Institute of Experimental Cancer Research, Epalinges, Switzerland). ↵1 This work was supported by the European Community QLK2-CT-2002-00846 Grant, the Karolinska Institute, the Swedish Health Insurance Company AFA, and the Swedish Research Council. ↵2 Current address: Laboratory of Parasitic Diseases, National Institute of Allergy and Infectious Diseases, National Institutes of Health, Bethesda, MD 20892. ↵4 Abbreviations used in this paper: BMM, bone marrow-derived macrophage; IRF, IFN regulatory factor; WT, wild-type; IFU, inclusion forming unit; i.n., intranasally; BMDC, BM-derived dendritic cell; MNC, mononuclear cell; iNOS, inducible NO synthase; HPRT, hypoxanthine guanine phosphoribosyltransferase; Ct, threshold cycle; pSTAT1, phosphorylated STAT1. Stark, G. R., I. M. Kerr, B. R. Williams, R. H. Silverman, R. D. Schreiber. 1998. How cells respond to interferons. Annu. Rev. Biochem. 67: 227-264. Levy, D. E., J. E. Darnell, Jr. 2002. Stats: transcriptional control and biological impact. Nat. Rev. Mol. Cell Biol. 3: 651-662. Meraz, M. A., J. M. White, K. C. Sheehan, E. A. Bach, S. J. Rodig, A. S. Dighe, D. H. Kaplan, J. K. Riley, A. C. Greenlund, D. Campbell, et al 1996. Targeted disruption of the Stat1 gene in mice reveals unexpected physiologic specificity in the JAK-STAT signaling pathway. Cell 84: 431-442. Durbin, J. E., R. Hackenmiller, M. C. Simon, D. E. Levy. 1996. Targeted disruption of the mouse Stat1 gene results in compromised innate immunity to viral disease. Cell 84: 443-450. Rosas, L. E., T. Keiser, R. Pyles, J. Durbin, A. R. Satoskar. 2003. Development of protective immunity against cutaneous leishmaniasis is dependent on STAT1-mediated IFN signaling pathway. Eur. J. Immunol. 33: 1799-1805. Collazo, C. M., G. S. Yap, S. Hieny, P. Caspar, C. G. Feng, G. A. Taylor, A. Sher. 2002. The function of γ interferon-inducible GTP-binding protein IGTP in host resistance to Toxoplasma gondii is Stat1 dependent and requires expression in both hematopoietic and nonhematopoietic cellular compartments. Infect. Immun. 70: 6933-6939. Gil, M. P., E. Bohn, A. K. O’Guin, C. V. Ramana, B. Levine, G. R. Stark, H. W. Virgin, R. D. Schreiber. 2001. Biologic consequences of Stat1-independent IFN signaling. Proc. Natl. Acad. Sci. USA 98: 6680-6685. Gongora, R., R. P. Stephan, R. D. Schreiber, M. D. Cooper. 2000. Stat-1 is not essential for inhibition of B lymphopoiesis by type I IFNs. J. Immunol. 165: 2362-2366. Boehm, U., T. Klamp, M. Groot, J. C. Howard. 1997. Cellular responses to interferon-γ. Annu. Rev. Immunol. 15: 749-795. Lighvani, A. A., D. M. Frucht, D. Jankovic, H. Yamane, J. Aliberti, B. D. Hissong, B. V. Nguyen, M. Gadina, A. Sher, W. E. Paul, J. J. O’Shea. 2001. T-bet is rapidly induced by interferon-γ in lymphoid and myeloid cells. Proc. Natl. Acad. Sci. USA 98: 15137-15142. Afkarian, M., J. R. Sedy, J. Yang, N. G. Jacobson, N. Cereb, S. Y. Yang, T. L. Murphy, K. M. Murphy. 2002. T-bet is a STAT1-induced regulator of IL-12R expression in naive CD4+ T cells. Nat. Immunol. 3: 549-557. Nguyen, K. B., W. T. Watford, R. Salomon, S. R. Hofmann, G. C. Pien, A. Morinobu, M. Gadina, J. J. O’Shea, C. A. Biron. 2002. Critical role for STAT4 activation by type 1 interferons in the interferon-γ response to viral infection. Science 297: 2063-2066. Nguyen, K. B., L. P. Cousens, L. A. Doughty, G. C. Pien, J. E. Durbin, C. A. Biron. 2000. Interferon αβ-mediated inhibition and promotion of interferon γ: STAT1 resolves a paradox. Nat. Immunol. 1: 70-76. Kuo, C. C., L. A. Jackson, L. A. Campbell, J. T. Grayston. 1995. Chlamydia pneumoniae (TWAR). Clin. Microbiol. Rev. 8: 451-461.
de la Maza, L. M., J. M. Goebel, C. W. Czarniecki, E. M. Peterson. 1984. Ultrastructural analysis of the growth cycle of Chlamydia trachomatis in mouse cells treated with recombinant human α-interferons. Exp. Mol. Pathol. 41: 227-235.
de la Maza, L. M., E. M. Peterson, J. M. Goebel, C. W. Fennie, C. W. Czarniecki. 1985. Interferon-induced inhibition of Chlamydia trachomatis: dissociation from antiviral and antiproliferative effects. Infect. Immun. 47: 719-722. Byrne, G. I., C. D. Rothermel. 1983. Differential susceptibility of chlamydiae to exogenous fibroblast interferon. Infect. Immun. 39: 1004-1005. Rothermel, C. D., G. I. Byrne, E. A. Havell. 1983. Effect of interferon on the growth of Chlamydia trachomatis in mouse fibroblasts (L cells). Infect. Immun. 39: 362-370. Rothfuchs, A. G., D. Gigliotti, K. Palmblad, U. Andersson, H. Wigzell, M. E. Rottenberg. 2001. IFN-α β-dependent, IFN-γ secretion by bone marrow-derived macrophages controls an intracellular bacterial infection. J. Immunol. 167: 6453-6461. Rothfuchs, A. G., C. Trumstedt, H. Wigzell, M. E. Rottenberg. 2004. Intracellular bacterial infection-induced IFN-γ is critically but not solely dependent on Toll-like receptor 4-myeloid differentiation factor 88-IFN-α β-STAT1 signaling. J. Immunol. 172: 6345-6353. Muller, U., U. Steinhoff, L. F. Reis, S. Hemmi, J. Pavlovic, R. M. Zinkernagel, M. Aguet. 1994. Functional role of type I and type II interferons in antiviral defense. Science 264: 1918-1921. Huang, S., W. Hendriks, A. Althage, S. Hemmi, H. Bluethmann, R. Kamijo, J. Vilcek, R. M. Zinkernagel, M. Aguet. 1993. Immune response in mice that lack the interferon-γ receptor. Science 259: 1742-1745. Sato, M., H. Suemori, N. Hata, M. Asagiri, K. Ogasawara, K. Nakao, T. Nakaya, M. Katsuki, S. Noguchi, N. Tanaka, T. Taniguchi. 2000. Distinct and essential roles of transcription factors IRF-3 and IRF-7 in response to viruses for IFN-αβ gene induction. Immunity 13: 539-548.
van den Broek, M. F., U. Muller, S. Huang, M. Aguet, R. M. Zinkernagel. 1995. Antiviral defense in mice lacking both αβ and γ interferon receptors. J. Virol. 69: 4792-4796. Ekman, M. R., J. T. Grayston, R. Visakorpi, M. Kleemola, C. C. Kuo, P. Saikku. 1993. An epidemic of infections due to Chlamydia pneumoniae in military conscripts. Clin. Infect. Dis. 17: 420-425. Montoya, M., G. Schiavoni, F. Mattei, I. Gresser, F. Belardelli, P. Borrow, D. F. Tough. 2002. Type I interferons produced by dendritic cells promote their phenotypic and functional activation. Blood 99: 3263-3271. Rothfuchs, A. G., M. R. Kreuger, H. Wigzell, M. E. Rottenberg. 2004. Macrophages, CD4+ or CD8+ cells are each sufficient for protection against Chlamydia pneumoniae infection through their ability to secrete IFN-γ. J. Immunol. 172: 2407-2415. Rottenberg, M. E., E. Castanos-Velez, R. de Mesquita, O. G. Laguardia, P. Biberfeld, A. Orn. 1996. Intracellular co-localization of Trypanosoma cruzi and inducible nitric oxide synthase (iNOS): evidence for dual pathway of iNOS induction. Eur. J. Immunol. 26: 3203-3213. Siebert, P. D., J. W. Larrick. 1992. Competitive PCR. Nature 359: 557-559. Livak, K. J., T. D. Schmittgen. 2001. Analysis of relative gene expression data using real-time quantitative PCR and the 2−ΔΔCt method. Methods 25: 402-408. Rottenberg, M. E., A. C. Gigliotti Rothfuchs, D. Gigliotti, C. Svanholm, L. Bandholtz, H. Wigzell. 1999. Role of innate and adaptive immunity in the outcome of primary infection with Chlamydia pneumoniae, as analyzed in genetically modified mice. J. Immunol. 162: 2829-2836. Rottenberg, M. E., A. Gigliotti Rothfuchs, D. Gigliotti, M. Ceausu, C. Une, V. Levitsky, H. Wigzell. 2000. Regulation and role of IFN-γ in the innate resistance to infection with Chlamydia pneumoniae. J. Immunol. 164: 4812-4818. Levy, D. E.. 2002. Whence interferon: variety in the production of interferon in response to viral infection. J. Exp. Med. 195: 15F-18F. Carlin, J. M., J. B. Weller. 1995. Potentiation of interferon-mediated inhibition of Chlamydia infection by interleukin-1 in human macrophage cultures. Infect. Immun. 63: 1870-1875. Summersgill, J. T., N. N. Sahney, C. A. Gaydos, T. C. Quinn, J. A. Ramirez. 1995. Inhibition of Chlamydia pneumoniae growth in HEp-2 cells pretreated with γ interferon and tumor necrosis factor α. Infect. Immun. 63: 2801-2803. Mannonen, L., E. Kamping, T. Penttila, M. Puolakkainen. 2004. IFN-γ induced persistent Chlamydia pneumoniae infection in HL and Mono Mac 6 cells: characterization by real-time quantitative PCR and culture. Microb. Pathog. 36: 41-50. Lieberman, L. A., M. Banica, S. L. Reiner, C. A. Hunter. 2004. STAT1 plays a critical role in the regulation of antimicrobial effector mechanisms, but not in the development of Th1-type responses during toxoplasmosis. J. Immunol. 172: 457-463. Lad, S. P., E. Y. Fukuda, J. Li, L. M. de la Maza, E. Li. 2005. Up-regulation of the JAK/STAT1 signal pathway during Chlamydia trachomatis infection. J. Immunol. 174: 7186-7193. Wang, J. P., S. E. Rought, J. Corbeil, D. G. Guiney. 2003. Gene expression profiling detects patterns of human macrophage responses following Mycobacterium tuberculosis infection. FEMS Immunol. Med. Microbiol. 39: 163-172. Fujiki, T., A. Tanaka. 1988. Antibacterial activity of recombinant murine β interferon. Infect. Immun. 56: 548-551. Denis, M.. 1991. 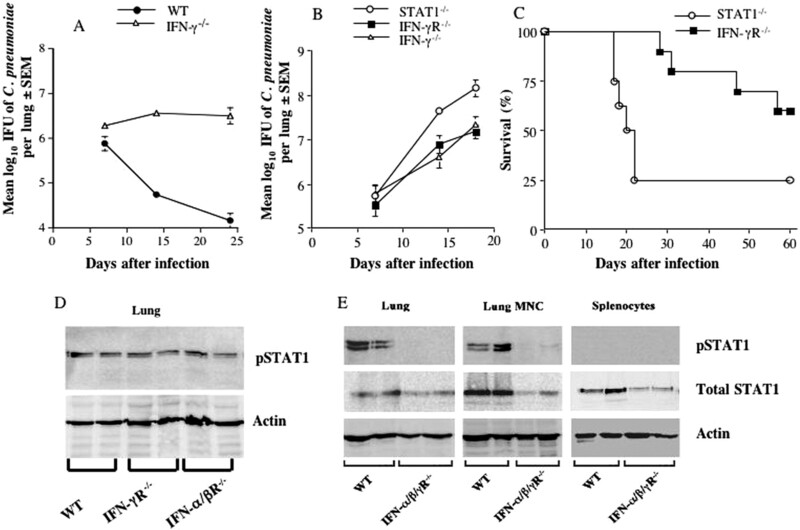 Recombinant murine β interferon enhances resistance of mice to systemic Mycobacterium avium infection. Infect. Immun. 59: 1857-1859. Ohya, K., T. Matsumura, N. Itchoda, K. Ohashi, M. Onuma, C. Sugimoto. 2005. Ability of orally administered IFN-α-containing transgenic potato extracts to inhibit Listeria monocytogenes infection. J. Interferon Cytokine Res. 25: 459-466. Orellana, M. A., Y. Suzuki, F. Araujo, J. S. Remington. 1991. Role of β interferon in resistance to Toxoplasma gondii infection. Infect. Immun. 59: 3287-3290. Rottenberg, M., R. L. Cardoni, R. Andersson, E. L. Segura, A. Orn. 1988. Role of T helper/inducer cells as well as natural killer cells in resistance to Trypanosoma cruzi infection. Scand. J. Immunol. 28: 573-582. James, S. L., T. L. Kipnis, A. Sher, R. Hoff. 1982. Enhanced resistance to acute infection with Trypanosoma cruzi in mice treated with an interferon inducer. Infect. Immun. 35: 588-593. Ortega, E., I. Algarra, M. J. Serrano, M. A. de Pablo, G. Alvarez de Cienfuegos, J. J. Gaforio. 2000. Enhanced resistance to experimental systemic candidiasis in tilorone-treated mice. FEMS Immunol. Med. Microbiol. 28: 283-289. Diefenbach, A., H. Schindler, N. Donhauser, E. Lorenz, T. Laskay, J. MacMicking, M. Rollinghoff, I. Gresser, C. Bogdan. 1998. Type 1 interferon (IFNαβ) and type 2 nitric oxide synthase regulate the innate immune response to a protozoan parasite. Immunity 8: 77-87.
Cooper, A. M., J. E. Pearl, J. V. Brooks, S. Ehlers, I. M. Orme. 2000. Expression of the nitric oxide synthase 2 gene is not essential for early control of Mycobacterium tuberculosis in the murine lung. Infect. Immun. 68: 6879-6882. Auerbuch, V., D. G. Brockstedt, N. Meyer-Morse, M. O’Riordan, D. A. Portnoy. 2004. Mice lacking the type I interferon receptor are resistant to Listeria monocytogenes. J. Exp. Med. 200: 527-533. O’Connell, R. M., S. K. Saha, S. A. Vaidya, K. W. Bruhn, G. A. Miranda, B. Zarnegar, A. K. Perry, B. O. Nguyen, T. F. Lane, T. Taniguchi, et al 2004. Type I interferon production enhances susceptibility to Listeria monocytogenes infection. J. Exp. Med. 200: 437-445. Manca, C., L. Tsenova, A. Bergtold, S. Freeman, M. Tovey, J. M. Musser, C. E. Barry, 3rd, V. H. Freedman, G. Kaplan. 2001. Virulence of a Mycobacterium tuberculosis clinical isolate in mice is determined by failure to induce Th1 type immunity and is associated with induction of IFN-αβ. Proc. Natl. Acad. Sci. USA 98: 5752-5757. Cousens, L. P., J. S. Orange, H. C. Su, C. A. Biron. 1997. Interferon-αβ inhibition of interleukin 12 and interferon-γ production in vitro and endogenously during viral infection. Proc. Natl. Acad. Sci. USA 94: 634-639. Lee, C. K., R. Gimeno, D. E. Levy. 1999. Differential regulation of constitutive major histocompatibility complex class I expression in T and B lymphocytes. J. Exp. Med. 190: 1451-1464. Takaoka, A., Y. Mitani, H. Suemori, M. Sato, T. Yokochi, S. Noguchi, N. Tanaka, T. Taniguchi. 2000. Cross talk between interferon-γ and –αβ signaling components in caveolar membrane domains. Science 288: 2357-2360. Nishibori, T., Y. Tanabe, L. Su, M. David. 2004. Impaired development of CD4+CD25+ regulatory T cells in the absence of STAT1: increased susceptibility to autoimmune disease. J. Exp. Med. 199: 25-34. Hibbert, L., S. Pflanz, R. De Waal Malefyt, R. A. Kastelein. 2003. IL-27 and IFN-α signal via Stat1 and Stat3 and induce T-Bet and IL-12Rβ2 in naive T cells. J. Interferon Cytokine Res. 23: 513-522. Tanabe, Y., T. Nishibori, L. Su, R. M. Arduini, D. P. Baker, M. David. 2005. Cutting edge: role of STAT1, STAT3, and STAT5 in IFN-αβ responses in T lymphocytes. J. Immunol. 174: 609-613. Wyrick, P. B.. 2000. Intracellular survival by Chlamydia. Cell Microbiol. 2: 275-282. Beatty, W. L., T. A. Belanger, A. A. Desai, R. P. Morrison, G. I. Byrne. 1994. Tryptophan depletion as a mechanism of γ interferon-mediated chlamydial persistence. Infect. Immun. 62: 3705-3711. Nelson, D. E., D. P. Virok, H. Wood, C. Roshick, R. M. Johnson, W. M. Whitmire, D. D. Crane, O. Steele-Mortimer, L. Kari, G. McClarty, H. D. Caldwell. 2005. Chlamydial IFN-γ immune evasion is linked to host infection tropism. Proc. Natl. Acad. Sci. USA 102: 10658-10663. Collazo, C. M., G. S. Yap, G. D. Sempowski, K. C. Lusby, L. Tessarollo, G. F. V. Woude, A. Sher, G. A. Taylor. 2001. Inactivation of LRG-47 and IRG-47 reveals a family of interferon γ-inducible genes with essential, pathogen-specific roles in resistance to infection. J. Exp. Med. 194: 181-188. Ramsey, K. H., G. S. Miranpuri, I. M. Sigar, S. Ouellette, G. I. Byrne. 2001. Chlamydia trachomatis persistence in the female mouse genital tract: inducible nitric oxide synthase and infection outcome. Infect. Immun. 69: 5131-5137.